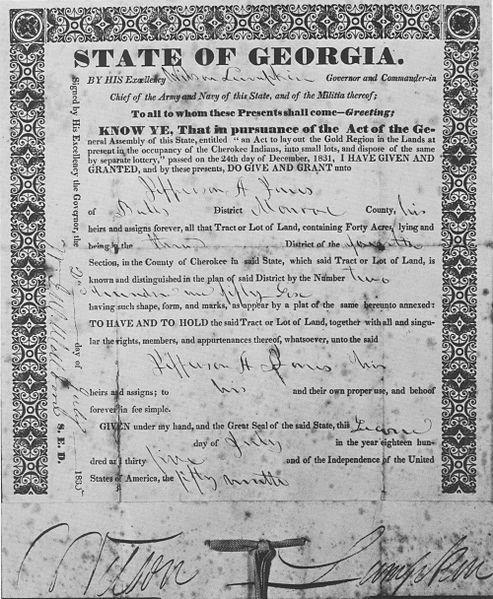 In the early 1800s, the newly formed state of Georgia had a lot of new land under its control. The land had been taken mostly from the native Muskogee and Cherokee people, and leaders of the young American state were looking for ways to transfer the land to white settlers. What they ultimately decided on was a series of lotteries. The forced transfer of property from native people to white settlers was common in America during the 19th century, but the lottery system was not. It meant that basically any white male adult in Georgia, rich or poor, had the same shot at winning a valuable piece of land. And, while the system itself was unjust and just plain wrong on multiple levels, it also set up an ideal research experiment. If you're a social scientist looking back, what you see in Georgia in the early 1800s isn't just a lottery, it's a randomized controlled trial. And it allows economists to ask a question that's still relevant today: What happens to a family when it suddenly comes into wealth? I have to confess, I'm a little obsessed with measures of economic mobility. These measures address the basic elements of the American Dream. We get plenty of platitudes from politicians about the ability to start out from modest beginnings and achieve great success as an adult. Here's a bit more information to help explain yesterday's story Five facts about achieving the American Dream. We've gotten some comments from listeners about how to interpret our five facts, and one of the biggest areas of confusion concerns the distinction between "absolute" and "relative" measures economic mobility.